Although this news isn’t as threatening as the title of the article implies: HAWAII LAVA FLOW NEARS NATIONAL PARK, it is still some news as it could be the first lava flow to cross into the park in over a lava. The flow itself is headed towards what is called the “Waikupanaha ocean entry” on the southeast side of the island. The lava flow has about one mile to go before it reaches the Pacific Ocean, but it has travelled several hundred feet (maybe 100 meters) over the last 10 days according to Park Rangers and USGS geologists monitoring the flow’s progress. Klyuchevskoy has already had a busy year and now we have some recent photos showing a lava flow that is snaking down the side of the volcano. The website with the lava flow image has a pile of other great eruption photos of Klyuchevskoy over the last couple of years and well worth the time to look through them all – the volcano is definitely one of those classic arc volcanoes in both shape and activity. It seems that a new fissure eruption has begun at Piton de la Fournaise on Reunion Island in the Indian Ocean*. In fact, the report goes onto say that a small lava lake has formed at the main crater of the eruption. 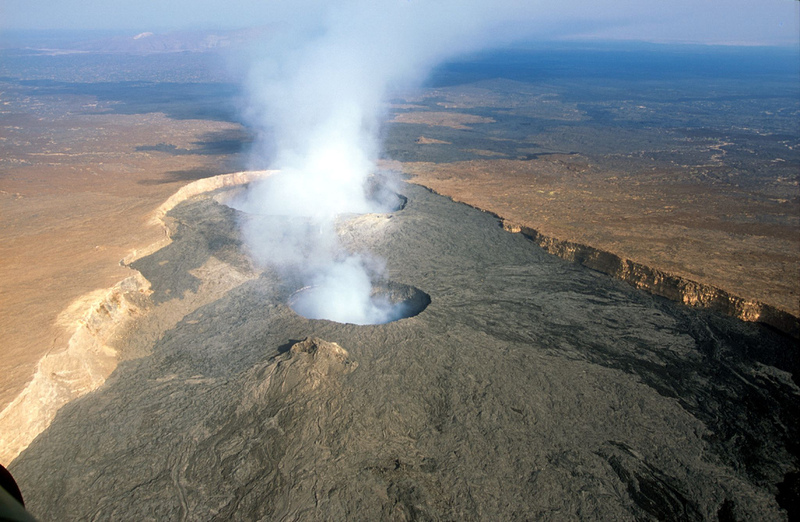 This marks the first eruption at Piton de la Fournaise since March 2007. Piton de la Fournaise is a large shield volcano associated with the Reunion Island Hotspot. 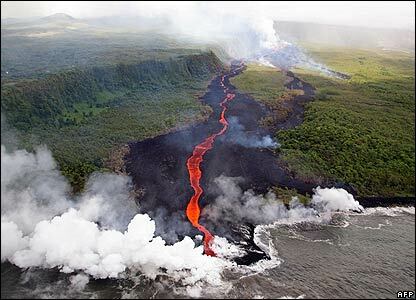 The volcano has frequent eruptions, mostly in the form of effusive lava flows of basalt, similar to the Hawaiian volcanoes. This could be an interesting new eruption because the initial eruptions suggest this is a flank eruption outside the caldera, but this might just be a product of a mistaken report. *Update 9/21/08: Thanks to Anthony for noticing that Reunion Island is in the Indian Ocean, not the Pacific. Sorry about misplacing the island!